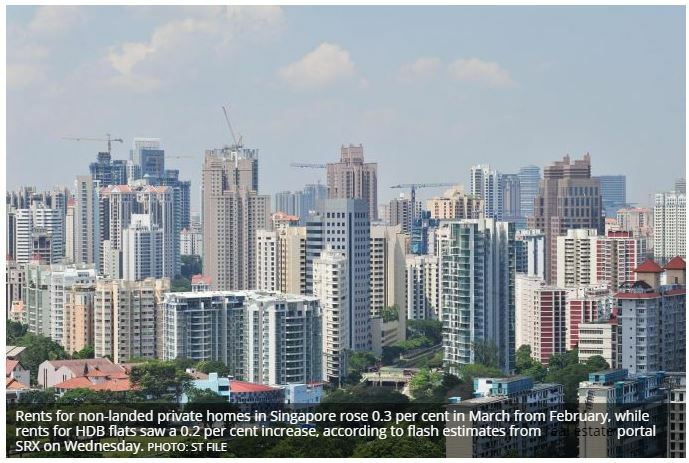 RENTS for non-landed private homes in Singapore rose 0.3 per cent in March from February, while rents for HDB flats saw a 0.2 per cent increase, according to flash estimates from� real estate� portal� SRX on Wednesday. Year on year, rents for non-landed private properties increased by� 1.5 per cent from� March� 2018. Compared to its January 2013 peak, rents were still down 17.7 per cent. OrangeTee & Tie research and consultancy head Christine Sun said leasing activities picked up significantly for both the private and public housing sectors last month. Rental transactions� for condos rose 41.4 per cent month on month, with about 5,184 units rented in March.� HDB rental� volume increased 58.3 per cent last month, with 2,220 HDB flats rented. Looking at past data trends, she said March was one of the busiest months for leasing activities, as it recorded the second or third-highest monthly leasing transactions of the year for 2016 to 2018. She added that leasing activities usually picks up from March onwards, which often marks the beginning of the most active leasing season that may last until the August-September period. Year on year, rental volume in March 2019 was still 1.3 per cent lower than the 5,250 units rented in March 2018. Ms Sun noted a recent pick-up in rental demand from expats working in the service and hospitality industries, and highlighted the upcoming expansion of Singapore’s two integrated resorts – Marina Bay Sands and Resorts World Sentosa – as potential catalysts for further rental demand from these sectors.